This is the city-owned vehicle that was driven by former Deputy Fire Commissioner John McNicholas at the time of a crash on Lake Shore Drive. In a federal courtroom this week, two police whistleblowers are trying to prove the Chicago Police Department observes a code of silence to cover up misconduct. Meanwhile, in every corner of Chicago outside that courtroom, proof of the code pops up all the time. While the code is usually blue — one cop covering up for another — sometimes it shades toward purple — a cop covering up for a firefighter. It’s a kind of professional courtesy. 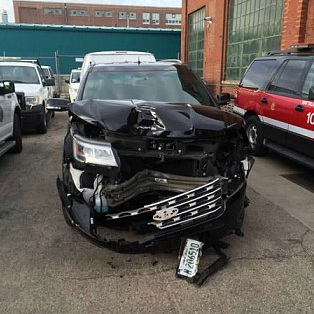 Just this week, City Hall disclosed that the third highest-ranking member of the Chicago Fire Department got really drunk one night last month and crashed a city-owned SUV in Lincoln Park. If you — John Q. Citizen — did that, the cops on the scene would immediately administer a sobriety test and charge you with drunk driving. But the firefighter, John McNicholas, was not administered a Breathalyzer test until four hours later and was not charged with drunk driving. If that looks like preferential treatment, it surely is. When McNicholas finally was tested, his blood-alcohol level was 0.154, nearly twice the standard at which you are presumed under the law to be driving drunk. McNicholas resigned as deputy commissioner after the crash and agreed to a “full separation” from the Chicago Fire Department. Nobody can seriously question anymore whether a code of silence exists within the Chicago Police Department. Not after a long string of slow-walking, look-the-other-way public scandals, from Jon Burge (tortured suspects) to Anthony Abbate (beat up a bartender) to the cops who ran the David Koschman death investigation (gave a mayor’s nephew a pass) to the Laquan McDonald shooting (took forever to release a damning video). It is almost comical that Mayor Rahm Emanuel is trying to duck having to testify to an indisputable fact — yeah, there is a code of silence — in the federal trial. The only real question is how far it goes. The trial centers on allegations by two police officers that they were punished by their supervisors after helping federal investigators convict two cops of stealing money from drug dealers. Who’s telling the lawyers that? A lot of the same folks who claimed for years there was no code of silence at all.